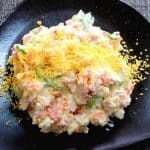 Korean potato salad is made from boiled, mashed potatoes and mixed into mayonnaise with diced vegetables. The secret is in the mayonnaise. Cut the cucumber piece in half. Then dice into very thin slices. Take out a mixing bowl. Place the sliced cucumbers in and coat with 1 tablespoon of salt. Thoroughly mix the salt onto the cucumbers with your hands. Let it sit for 30 minutes. Next, dice the ham, onions and carrots into small bite sized pieces. Squeeze out the excess water from onions and carrots with a paper towel. Then hard-boil two eggs. Separate the fully-cooked egg yolk from the white. Chop the egg whites into small bits and set the yolk aside. Take out a large pot and fill with water. Boil the potatoes for 20 minutes. In the meanwhile, check on the cucumbers. Drain the water and give them a wash under a running faucet to take off the salt. Then take a handful at a time and give a nice firm squeeze to take out the water. Set the squeezed cucumbers aside. Check back on the boiling potatoes and see if they are soft. Drain in a strainer and let them drip-off excess water for about a minute. Take out a large mixing bowl. Place in the cooked potatoes and mash them with a spoon. Then place in the diced ham, carrots, egg whites, onion and cucumbers. Place in the mayonnaise next. Then place in the sugar, salt and black pepper and mix thoroughly. Finally use a cheese-grater to grate the egg yolk over the top. Enjoy! Make sure to squeeze the water out of the diced vegetables (cucumbers, carrots and onions). This will prevent your potato salad from becoming watery.